Based on Dean Koontz's novel of the same name, the movie follows Odd Thomas (Anton Yelchin), a twenty-something-year-old with the power to see the dead. Choosing to embrace his gift, he uses his ability to help solve murders, finding justice for the slain ghosts who seek his help. His noble endeavors are often aided by his loyal girlfriend Stormy (Addison Timlin) and the town's local police chief (Willem Dafoe) who knows Odd's secret. In addition to the dead, Odd can also see invisible parasites called "bodachs" that tend to swarm around violence and destruction. When a mysterious stranger shows up in town with an unusually high number of bodachs, Odd rushes into action, hoping to prevent a massive tragedy that could spell doom for his loved ones. Supernatural thrillers of this type are pretty common, and despite its best efforts, the film never really finds a unique take on the material. Sommers' script (supposedly quite faithful to the source material) desperately tries to give the plot and characters a quirky edge, and the dialogue is almost overwhelmingly cutesy in its attempts to sound hip. This is particularly evident in Odd and Stormy's relationship, and their frequent bouts of "amusing banter" are very cheesy and at times downright painful to endure. And even beyond just being extremely irritating, all of this assembly line eccentricity fails to successfully dress up the otherwise clichéd and thin characterizations. A similarly quirky voice over narration from Odd serves to clue us in on the rules of his powers and the story's supernatural mythology, but these facts are all doled out very quickly, lazily, and haphazardly. Likewise, the mythology isn't all that original or fleshed out, and despite their effectively creepy design, the villainous bodachs prove to be pretty inconsequential. Overall, the film has a clunky, unfinished feel to it, almost like it needs another edit. And though Sommers tries to inject some fun visuals into the proceedings, the style comes across as a bit cheap, evoking a TV aesthetic with middling CG effects and flashy slow motion shots that do little to enhance the mediocre action. Some of the acting is also a bit suspect, with Addison Timlin becoming the weakest link. I've seen the actress in a few other productions and she's been just fine, but here her line readings are strangely flat and affected. Of course, in her defense, it's hard to imagine anyone doing much better with the incredibly lame dialogue she has to recite. Thankfully, star Alton Yelchin does do an admirable job in the title role. His character isn't all that interesting, but he brings a certain intensity and good hearted nobility to the part that works well, helping to keep the audience interested in his story. The plot itself is rather uninspired with several predictable twists (including an ill-conceived ending that seemingly ignores some of the supernatural rules established earlier), but the runtime is not without its thrills. Sure, several hand holding flashbacks and obvious reveals had me rolling my eyes, but there are a few solid set pieces and gory scares here and there, and Sommers' direction remains competent. It might sound like I'm being hard on the movie, but at the end of the day, I was at least mildly entertained by its dumb antics. 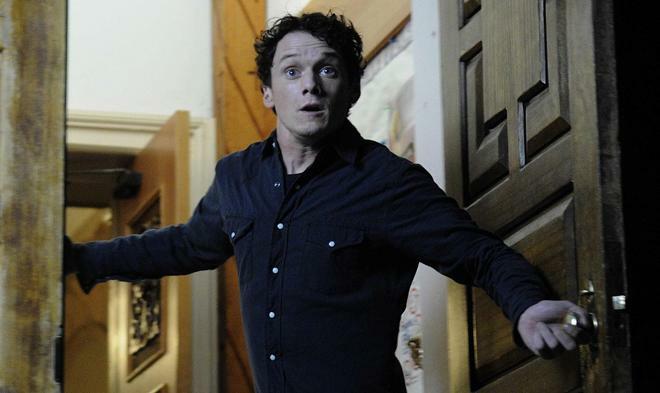 'Odd Thomas' wants to be a fun, scary, exciting, and amusingly madcap supernatural thriller. Unfortunately, its mystery is predictable and its attempts at quirky charm are just downright annoying. Add in some comparatively low budget effects work and clunky editing, and the whole flick starts to veer into thoroughly mediocre territory. Still, fans of the book will likely want to give this a rent, and Yelchin's performance and Sommers' energetic style do have some entertainment value. Plagued by troublesome legal issues, the movie has received a decidedly uneventful release (it's basically being dumped on Blu-ray), but there's just enough merit here to keep those creepy bodachs at bay. Image Entertainment brings 'Odd Thomas' to Blu-ray on a single BD-25 disc that comes housed in a keepcase in a cardboard slipcover with a lenticular image that reveals a horde of bodachs. A separate DVD copy is also included. After some skippable trailers, the screen transitions to a standard menu. The packaging indicates that the release is region A coded. The movie is provided with a 1080p/AVC MPEG-4 transfer in the 2.35:1 aspect ratio. Though there are a few minor technical quirks, this is a strong transfer marked by impressive detail. The digital source is mostly clean and pristine, but there is some negligible banding and a hint of shimmering in isolated shots. Overall clarity is very strong, offering a sharp picture full of texture. Dimension is also pleasing, though there are some sequences that feature an overly digital, flat quality. Going along with this, contrast is sometimes overexposed with blooming whites. Colors are bold and bright, with greens and reds offering some nice pop. Black levels are also solid, but they do veer slightly toward blue in some nighttime scenes. 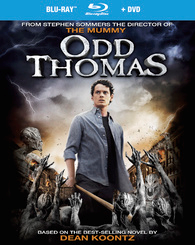 'Odd Thomas' has a rather generic and occasionally cheap digital visual style, but the image is sharp, colorful, and crisp, resulting in a technically sound transfer that should please fans. The film is presented with an English DTS-HD MA 5.1 track along with optional English SDH subtitles. With solid surround immersion and some energetic design work, this is a generally effective mix. Dialogue is clear and well prioritized throughout with no pops or crackles. The soundstage has a fairly enveloping sense of space, evoking general ambiance for the film's various small suburb locations. Action scenes are also well done, and the track perks up nicely with lively effects work. Various crashes, thuds, punches, gunshots, explosions, and creepy screeches come through with great directionality and imaging, creating an engaging and active world around the listener. Several scenes where the bodachs swirl around the room are particularly impressive. Dynamic range is wide and distortion free, and deep bass activity brings some welcome oomph to all of the supernatural mayhem. Fitting and well produced, this is a good track through and through. The design work never demonstrates the type of nuance and depth that elevates the very best audio tracks, but the bouncy effects and thumping score offer a fun diversion. 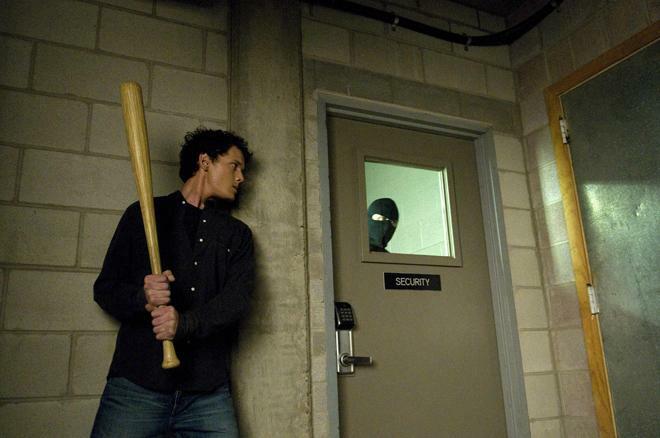 'Odd Thomas' is a mediocre but occasionally entertaining supernatural mystery flick. While the plot is very familiar and the quirky characters are a bit annoying, there are some decent thrills here and there. The video transfer and the audio mix are both good, offering a very solid home theater presentation. Sadly, there are no supplements included. The film is mostly underwhelming, but it has its momentary charms, and fans of the book and similar efforts might want to give this disc a rent.